We are headed toward Bear Tooth Pass 10,947 feet high. Some folks on The Scampy Team feel that a climb as this one will be too much for Señor Tránsito. On the other hand, Tránsito has been quoted as declaring, "I can make it!" In any case, Bear Tooth Pass will not be reached until tomorrow! Click [Here] for info about Beartooth Highway! Well, just maybe we shall reach Beartooth Pass today! On the way, George made one wrong turn that took The Team about 20-miles west of the correct road. No matter! We got that right now. At the Blue Rooster Cafe, we bought a cup of coffee, a dozen eggs, a gallon milk, 2-candy bars and filled Scampy's fresh water tank. 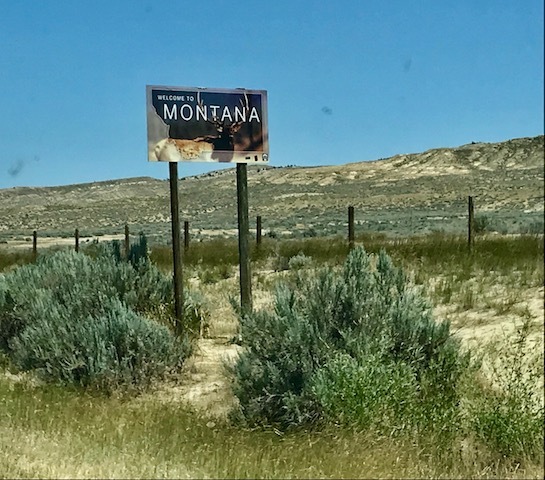 passed this Montana border sign. Little iPhone is wild about these three rock wall formations. When we arrived in the Small City of Red Lodge, George crashed into nap time. That old guy had just plain run-out-of-gas! But, 1/2-hour later, George was Blogging again! George has good recuperative powers! After waking up from Nap Time, this video is what happened! The Scampy Team wished to find a Nite Camp that looked down at Red Lodge from the hills to the east of the city. We got up there with no problems. The roads, however, did not have views looking down as we wished. You may view our Nite Camp Location Map to see where we ended up! Old Chinese proverb: you never make wrong turn. as long as you have a full tank of fuel. and a full belly. I just published my first iMovie video using our Mac's built-in camera! Whatta you think? Any good? Bear Tooth Mountain is awesome. Be careful but most of all enjoy some spectacular scenery. First time we drove it the end of September and we got in a blizzard on top of mountain and second time was in July and there was still snow many places. Enjoy to the fullest. Thank you for sharing your excitement with me about Beartooth Pass! Your iMovie video is pretty darn good! Don't know if it is quite Academy Award material, but it certainly was excellent as a first time effort. Kudos! I'm adding video to my Blog as a way of communicating with Readers in a direct way, as opposed to writing. Also, I want Readers to know how I look and sound and understand my personality. That is a very nice compliment! George Burns! George, I thought you sound so strong in the video. What a good idea to post a video telling what you did. Maybe you can start a youtube channel. Guess what? I've had a YouTube channel for many years! I used to publish lots of videos on YouTube.